Store-bought granola can be full of added sugar and low in fiber and nutrition. 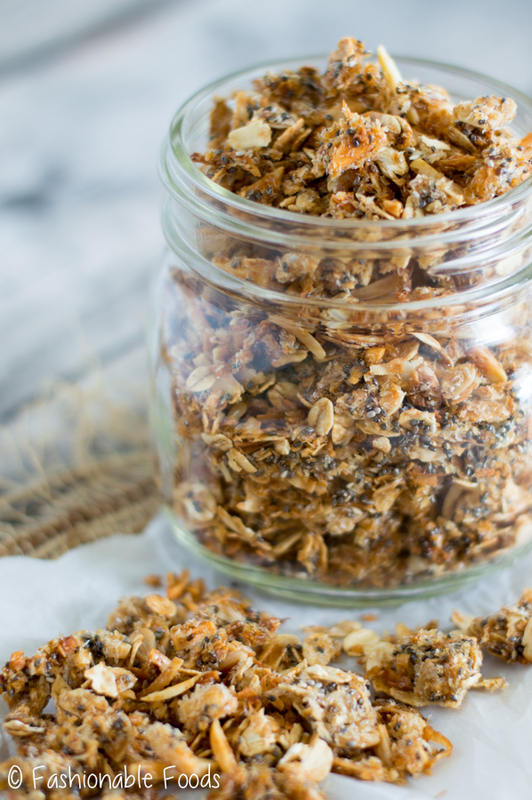 This crunchy high fiber granola is full of great ingredients and will fill you up, making it the perfect healthy breakfast! I have a love/hate relationship with granola. Love because granola. Duh. Crunchy, sweet, versatile… what’s not to love? Well, a lot of store-bought (and even a lot of homemade) are full of sugar, high in calories, high in carbs, and low in fiber and nutrition. 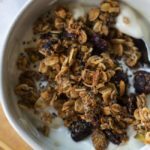 Recently, I set out on a mission to make a high fiber granola that tastes delicious, but packs in a lot of nutritional value. I definitely hit the jackpot with this crunchy high fiber granola. It’s lightly sweet, perfectly crunchy, and packs in 14 grams of fiber! 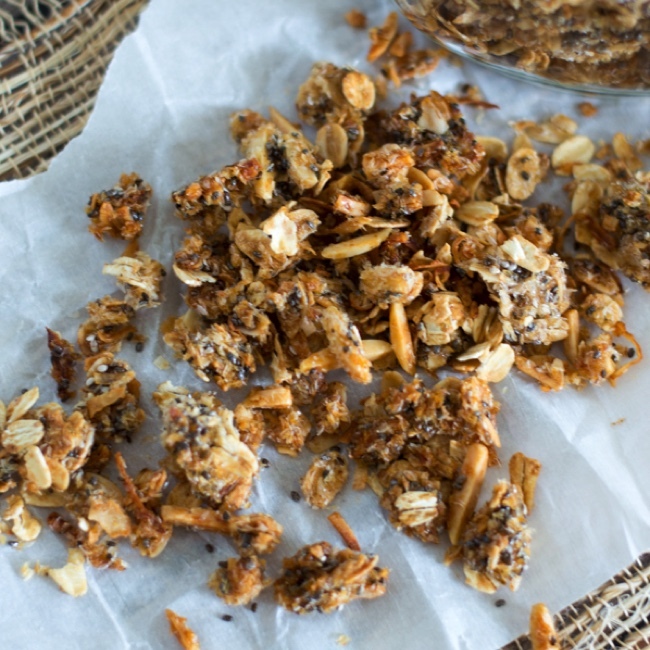 Most importantly, this crunchy granola is delicious. The bulk of the fiber comes from the chia seeds and psyllium husks. 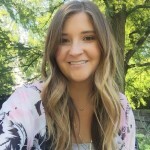 I’m sure you’ve heard of chia seeds by now since they have gained popularity over the last few years. Psyllium husks are basically pure fiber – 1 tablespoon contains 6 grams of fiber, making them perfect for high fiber granola. The whole granola making process couldn’t be any easier. Measure your ingredients, mix ’em up, and bake until golden. If you want larger clusters, avoid stirring the granola until it has cooled. I like a mix of clusters and pieces, so I lightly mix mine. 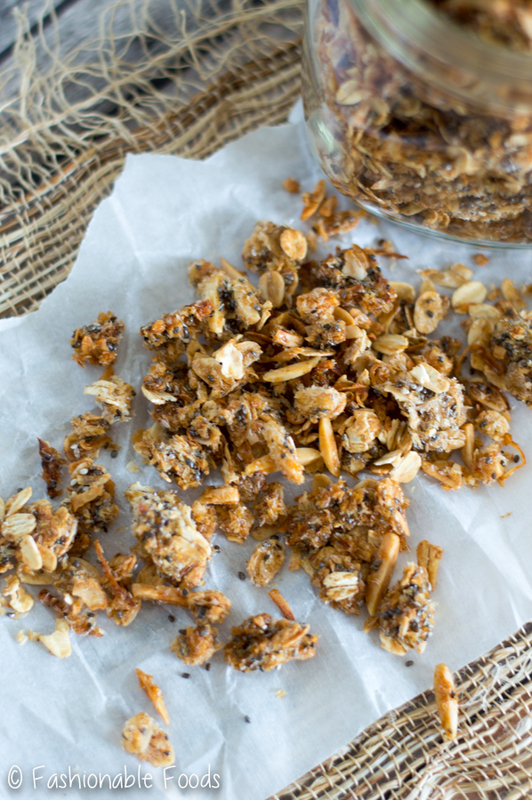 Before you know it you’ll have granola at the ready for breakfast or a crunchy snack. 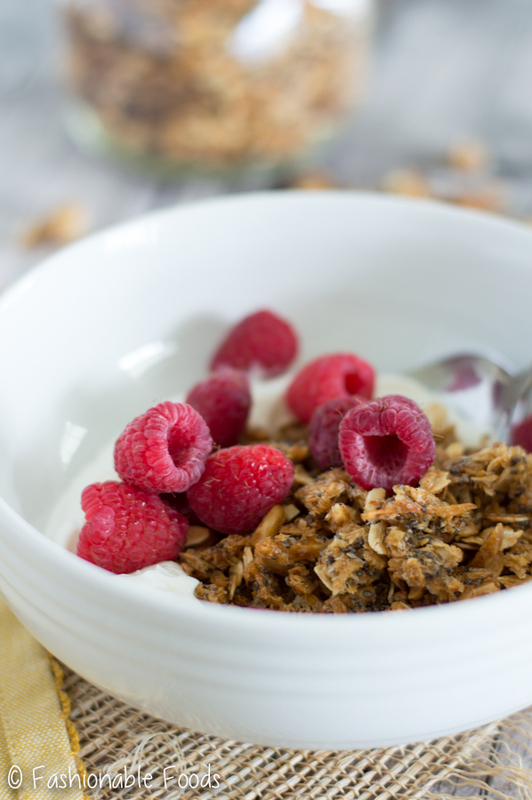 Just 1/2 cup of this granola, some milk, and a handful of raspberries makes for a satisfying breakfast. I also love pairing it with low-sugar Icelandic yogurt and raspberries. You’ll be shocked at how well this fills you up (thanks to that fiber!) and keeps you satiated throughout the morning. Let’s break down the nutritional value. A 1/2 cup serving of this high fiber granola clocks in at 260 calories, 13 grams fat, 18 grams net carbs (carb count minus the fiber), 5 grams protein, and 14 grams of fiber. I consider the 1/2 cup portion as a meal with milk or yogurt, but a 1/4 cup would make for a good snack portion size. Most store-bought granolas have around 2 grams fiber, which means they don’t fill you up for very long. Fiber is super important in our diets as it adds bulk in the digestive tract to help move things along. Not very glamorous, I know, but it also helps with blood sugar regulation, weight loss, and can lower cholesterol. Pretty cool, right?! 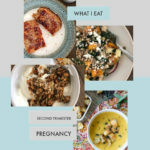 Ok now that we’ve had a little nutrition lesson… ? You can change up this granola pretty easily by using whatever your favorite nut is and playing with the flavorings. Dried fruit can also be added, but I like to eat mine with fresh fruit so I skipped out on that. Dried fruit would make this a great on-the-go option, though! 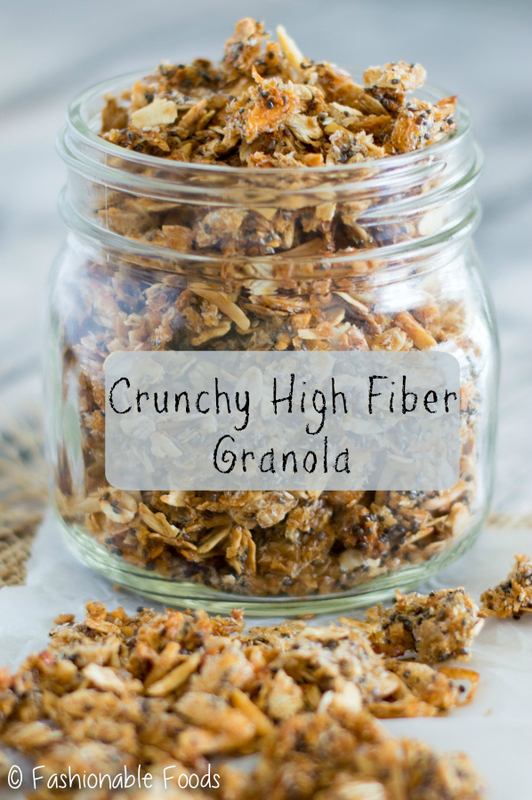 Crunchy high fiber granola has quickly become one of my new favorite breakfasts. 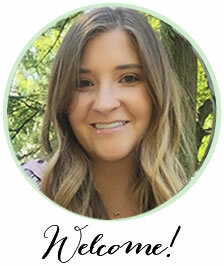 It’s easy to make, healthy, and super delicious! What more could you ask for? In a large bowl, combine the oats, almonds, coconut flakes, chia seeds, and psyllium husks. Set aside. In a small pot over low heat, combine the honey, coconut oil, and cinnamon unti everything is melted and well combined. Remove the pan from the heat and stir in the vanilla extract and salt. Pour the honey mixture over the granola ingredients and toss well until everything is coated. Pour the granola mixture between 2 baking sheets and transfer to the preheated oven. Bake the granola for 15 minutes and then rotate the pans (rotate the back to the front and rotate racks, too). Then, bake the granola for another 15 minutes. You want the granola to be golden brown, so continue rotating the pans if yours isn’t ready at the 30 minute mark. Avoid stirring the granola if you want clusters! 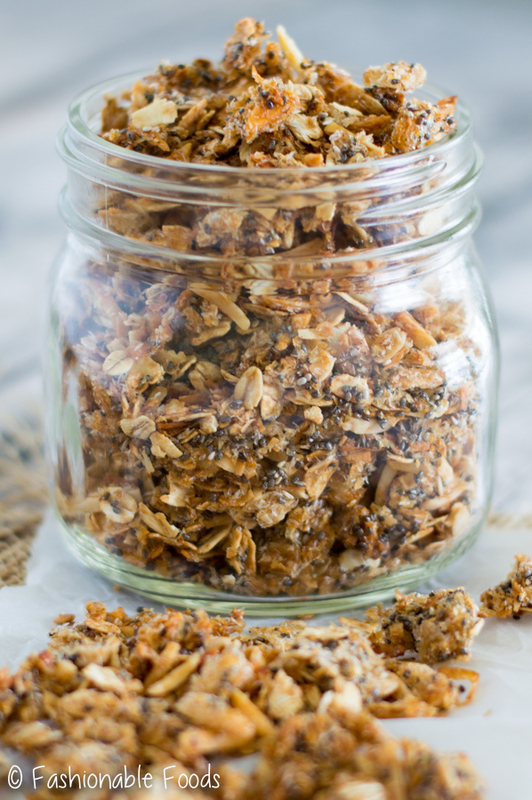 Allow the granola to cool completely before transferring to a jar or airtight container for storage. *If you don't need this gluten-free, you can use any rolled oats. *1/3 cup of honey adds a light sweetness, so if you prefer a sweeter granola you may want to increase it to a 1/2 cup. I recommend making it first with the 1/3 cup and then if you find it not sweet enough, just drizzle it with honey when you eat it. Then, next time you make it you can adjust the amount to suit your taste. 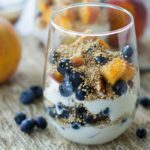 Love granola……and this looks fantastic!!!!!!!!! This looks delicious. Could I sub the chia seed for flax seed and use Extra Virgin Olive Oil instead of coconut oil. Flax seed will work, but I wouldn’t recommend the olive oil as it has a strong flavor and is too savory for this. However, if you don’t mind that, then go for it! I was wondering about adding hemp seed, wheat germ, crushed walnuts and cashews, and possibly a little protein powder. What do you think?